I recently finished reading The Guns of August, the Pulitzer Prize-Winning Classic about the Outbreak of World War I, by Barbara W. Tuchman. Wilson, facing this group of “ignorant men,” as he called them, and accompanied by his fellow officer and future chief, Sir John French, “who knows nothing at all about the subject,” pinned up his great map of Belgium on the wall and lectured for two hours. He swept away many illusions when he explained how Germany, counting on Russia’s slow mobilization, would send the bulk of her forces against the French, achieving superiority of numbers over them. He correctly predicated the German plan of attack upon a right-wing envelopment but, schooled in the French theories, estimated the force that would come down west of the Meuse at no more than four divisions. He stated that, if all six British divisions were sent immediately upon the outbreak of war to the extreme left of the French line, the chances of stopping the Germans would be favorable. Coming from Haldane this conclusion had a profound effect upon Liberal thinking and planning. The first result was a naval pact with France by which the British undertook at threat of war to safeguard the Channel and French coasts from enemy attack, leaving the French fleet free to concentrate in the Mediterranean. As this disposed the French fleet where it would not otherwise be, except by virtue of the agreement, it left a distinct obligation upon Britain…This curious document managed to satisfy everybody: the French because the whole British Cabinet Government had now officially acknowledged the existence of the joint plans, the antiwar group because it said England was not “committed,” and Grey because he had evolved a England was not “committed,” and Grey because he had evolved a formula that both saved the plans and quieted their opponents. To have substituted a definite alliance with France, as he was urged in some quarters, would “break up the Cabinet,” he said. War pressed against every frontier. Suddenly dismayed, governments Struggled and twisted to fend it off. It was no use. Agents at frontiers were reporting every cavalry patrol as a deployment to beat the mobilization gun. General staffs, goaded by their relentless timetables, were pounding the table for the signal to move lest their opponents gain an hour’s head start. Appalled upon the brink, the chiefs of state who would be ultimately responsible for their country’s fate attempted to back away but the pull of military schedules dragged them forward. How far reduced, how distant the end, no one yet knew. No one could realize that for numbers engaged and for rate and number of losses suffered over a comparable period of combat, the greatest battle of the war had already been fought. No one could yet foresee its consequences: how the ultimate occupation of all Belgium and northern France would put the Germans in possession of the industrial power of both countries, of the manufactures of Liege, the coal of the Borinage, the iron ore of Lorraine, the factories of Lille, the rivers and railroads and agriculture, and how this occupation, feeding German ambition and fastening upon France the fixed resolve to fight to the last drop of recovery and reparation, would block all later attempts at compromise peace or “peace without victory” and would prolong the war for four more years. At the time of the disaster General Marquis de Laguiche, the French military attache came to express his condolences to the Commander • in Chief. ‘We are happy to have made such sacrifices for our Allies,” the Grand Duke replied gallantly. Equanimity in the face of catastrophe was his code, and Russians, in the knowledge of inexhaustible supplies of manpower, are accustomed to accepting gigantic fatalities with comparative calm. The Russian steam roller in which the Western Allies placed such hopes, which after their debacle on the Western Front was awaited even more anxiously, had fallen apart on the road as if it had been put together with pins. In its premature start and early demise it had been. Just as the Grand Duke said, a sacrifice for an ally. Whatever it cost the Russians, the sacrifice accomplished what the French wanted: withdrawal of German strength from the Western Front. The two corps that came too late for Tannenberg were to be absent from the Mame. After the Marne the war grew and spread until it drew in the nations of both hemispheres and entangled them in a pattern of world conflict no peace treaty could dissolve. The Battle of the Mame was one of the decisive battles of the world not because it determined that Germany would ultimately lose or the Allies ultimately win the war but because it determined that the war would go on. There was no looking back, Joffre told the soldiers on the eve. Afterward there was no turning back. The nations were caught in a trap, a trap made during the first thirty days out of battles that failed to be decisive, a trap from which there was, and has been, no exit. A recommended read in the areas of history and military conflicts. 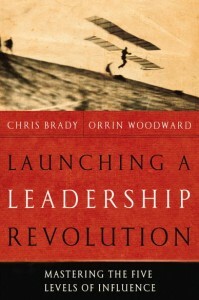 I recently finished reading Launching A Leadership Revolution – Mastering The Five Levels of Influence – by Chris Brady and Orrin Woodward. 25- “The concept of the Five Levels of Influence is especially helpful for many reasons. First, it helps an individual gauge his own ability and understand how and where to improve. Second, it helps a leader understand where people are in terms of ability and what to do to help them develop. Third, it assists a leader in evaluating the Leadership Level that exists in any portion of his or her organization. Understanding this information about self, people, and organizations becomes extremely helpful in diagnosing issues and providing guidance, correction, and direction. I recently finished reading Churchill – A Study In Greatness – by Geoffrey Best.